Hydro power plant Medna is planned close to the springs of Sana River, area that is planned to be Park of Nature. Coalition for Sana River is for more than six year fighting against this plant. The River Sana was classified as first class water quality in Republic of Srpska, and the upper area around the river flow is planned to be declared as a National Park in 2015. In spite of this, Republic of Srpska made a plan for building the hydroelectric project Medna at the source of Sana River, near the towns of Ribnik and Mrkonjic Grad. Nevertheless, the construction works began in 2010 despite the disapproval of local residents and other supporters, affected municipalities of Ribnik and Mrkonjić Grad and even the negative expert opinion of the Institute for Protection of Cultural, Historical and Natural Heritage of RS. Upon reviewing the plans for the construction, the Institute submitted 10 reasons not to build the HPP. Also, in the above mentioned lawsuit initiated by the Coalition, the Banja Luka District Court decided the studies of EIA contain false information. Despite these facts, investor LSB Elektrane commenced preliminary works - construction of the road and deforestation of the land next to the river bank. The company conducted the work without the necessary environmental and construction permit. Unfortunately, the Inspectorate of the RS, the authority responsible for ensuring compliance with environmental and construction regulations, has thus far failed to react and stop the continued illegal destruction of the source of the river Sana. The company also ignored the will of citizens and did not respect the decision of Banja Luka District Court and that of the RS Institute for the Protection of Cultural and Natural Heritage that disputed the construction of the plant. 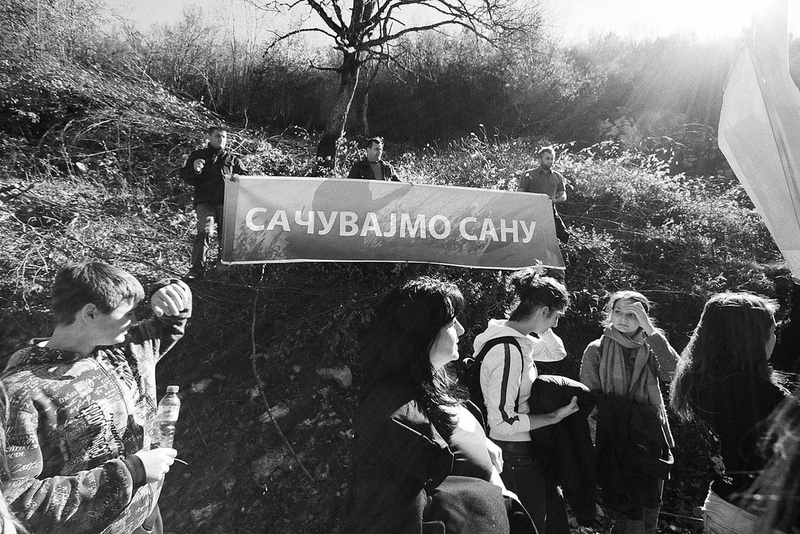 The Coalition for the Protection of Sana River gathers more than 20 organisations; they organized several mass protests, and launched a petition against the hydro-power plant which was signed by 8000 citizens. In 2013 LSB Elektrane sold the concession permit to the Slovenian company Intgerenergo. In September 2014, it was announced that the laying of the foundation stone of Medna HPP was to be attended by the President of RS Milorad Dodik. The Coalition has sent an open letter inviting him not to take part in the event, reminding the public dissent and the fact that the case is now at the Supreme Court. The letter stressed the commencement of construction; before a judicial decision is reached on the matter is both illegal and irresponsible. In the end, the President of RS did not attend the event, although he has never answered the letter. In 2015 construction is ongoing although five lawsuits are still on the court. Local community is already facing problems with lack of drinking water and with problems due to mining for the tunnel. Company Names or State Enterprises Kelag International from Austria - Investor is for years refusing to have a conversation with representatives of Coalition for Sana River. Court decision was not respected. Development of Alternatives The Coalition for the Protection of Sana demanded that the Ministry of Industry, Energy and Mining of Republic of Srpska cancel the concession agreement. In 2009, the coalition filed a complain on the project environmental permit and environmental impacts assessment study. In addition, the Coalition demanded that the Ministry of Spatial Planning, Civil Engineering and Ecology begin the procedure for prior protection of the river Sana, as an interim solution until its final declaration as a nature park. They also suggested that investment in sustainable tourism would be better option for the local development. Why? Explain briefly. In the past the Banja Luka District Court made two decisions against The Ministry of Spatial Planning, Civil Engineering and Ecology of Republic of Srpska disputing the construction of the HPP Sana. However, these decisions have not been respected. In December 2013, Banja Luka District Court refused issuing the ecological permit for building the HPP. The same year LSB Elektrane sold the concession permit to the company Intgerenergo from Slovenia. Da li će se graditi hidroelektrana na Sani? BiH: Pobeda ekologa sa Sane -poništena ekološka dozvola za hidroelektranu! Protiv HE na rijeci Sani!